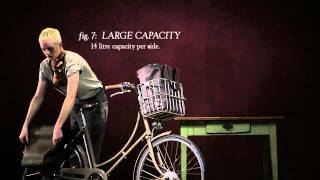 Brooks Roll Up Panniers are inspired by the Cyclist's Hold-alls, first featured in the 1890's catalogue. As the originals, the new panniers can be rolled up or easily released when needed. This pair of commuter bags for traditional transport bicycles are entirely made of water resistant cotton with leather finishing. On the top of the bag, is an elastic cord for the attachment to the bicycle rack, which can hold additional objects to carry during urban transit. Last, but not least, the Roll Up Panniers are ''self closing'', as they feature magnets on the flaps.